I tend to leave the edges of the garden away from the vegetable polycultures to do their own thing as far as is practical. I have an ever increasing respect for nature knowing what is best and like to trust her to fill in these gaps as she pleases. What I have then noticed as a consequence is that nature’s tendency to is towards what we might look on as excess. Every part of the space is used, plants crowd in upon each other, grow through each other, bunch up tightly, cover all the ground and then spread upwards, laying themselves layer upon layer on top of each other. Seeing how this happens encourages me in turn to allow the cultivated parts of the garden to fill up with far more plants than I might otherwise have thought wise. 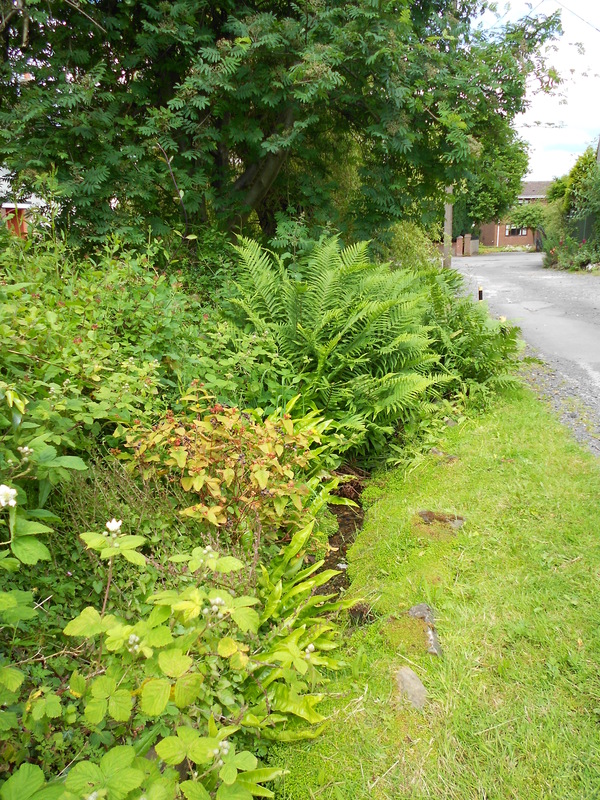 A very small stream runs across the very front of the front garden. I spent a very pleasant time there one sunny morning last week with a fascinated two year old. She was discovering that the water moved and exclaiming ‘it’s moving’ every time she threw in another piece of leaf or twig. Whilst she played I idly considered the plants that had colonised the other side of the bank. Bearing in mind that beneath them are large boulders with a very shallow layer of soil it is remarkable what nature has planted. At the base is a layer of a green mat like plant that colonises very damp patches (I don’t know the name). Then there is wild strawberry, campanula, ferns, dandelions, wild garlic, three cornered leek, buttercup, bramble and a few blades of grass. Above this ‘layer’ comes more bramble with hypericum, ferns, nettle, hedge woundwort and clove root. Poking through the top is dock running to seed, cleavers topped by a mass of honeysuckle. That’s about sixteen plants in a few feet of stream side. I am responsible for the wild strawberries, three cornered leek and wild garlic being there, everything else was brought by nature. I would not want most of these plants in the vegetable polycultures, but allowing them space on the wild edge of the garden increases the scope for biodiversity and as far as I can see must be a good thing. Unplanned and largely untended as it is this steam bank is nevertheless one of the loveliest parts of the garden and I can’t take any responsibility for that at all! 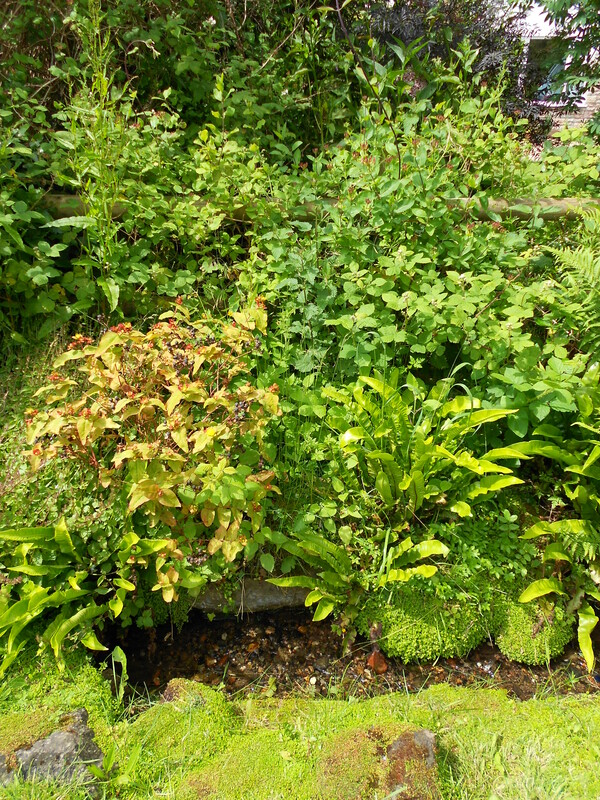 This entry was posted in Forest Gardening, Polycultures, Relationship with nature, Telford Garden and tagged three cornered leek, wild garlic, wild strawberry. Bookmark the permalink.